Rick Datodi and Helen Richards, both past presidents of the Society, discuss Caladenia integra. ANOS Victoria display at the first ANOS Conference in Wollongong 1990. George and Thelma Spice with a headless Barry Richards. George was our second Terrestrial Study Group Co-ordinator. At that meeting Bill Murdoch from Coal Point in NSW was the guest of honour and spoke on the cultivation of native orchids. Bill was a co-founder of the ANOS parent group. The committee resolved to book the lecture hall at the National Herbarium for subsequent meetings. At the Following meeting in October, Bill Murdoch was awarded the first life membership of ANOS Vic. for his efforts in establishing ANOS and for his continuing endeavours on behalf of native orchids. The Herbarium became our home until 1994, except for a period between November 1987 and July 1989, while the Herbarium was being renovated. During the break we held our meetings either at the Royal Victorian Horticultural Society Hall in Victoria Street, Melbourne or at the West Hawthorn Uniting Church Hall. We departed the Herbarium in October 1994, spent a few months at the St. Lukes Anglican Church Hall in Dorcas Street, South Melbourne, and transferred to the Burnley Horticultural College in March 1995. Burnley Horticultural College proved to be a good home for our meetings, but after eleven years of residence the cost of remaining there could no longer be justified. So in 2006 we had to look for a new home for our meetings and settled in at the Toorak Uniting Church Hall. Unfortunately, history repeated itself and after twelve years at the Toorak Uniting Church Hall the rising cost of the hall rental became exhorbitant and we had to move once again. So at the start of 2019 we found a new home for our meetings at the Glen Waverley Community Centre. ANOS Vic. has continually published a Bulletin since its establishment. Les Raynes was the first Editor and the inaugural Bulletin totalled four pages. Les was the Editor for two and a half years, followed by John Fanning for four years, Helen Richards for four years, Paul Phillips for ten years and Helene Wild for the past thirty years. Today our Bulletin is fourteen pages and a printed version is available in black and white or a full colour version is available by e-mail. 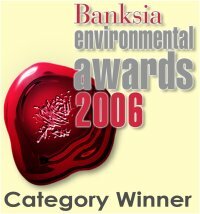 July 2006 - ANOS Victoria is joint winner with Department of Sustainability and Environment, Parks Victoria, Royal Botanic Gardens - Melbourne, Melbourne University, Victoria University and Royal Melbourne Institute of Technology University in the Prime Minister's Banksia Awards for the Environment in the category of Land and Biodiversity. This is to recognize the cooperative work done by all the groups in orchid conservation. The submission was titled "Back from the Brink: Saving Victoria's Threatened Orchids "